St. Hildegard was the tenth child of a noble German family. She was promised to the church and raised from the time she was 8 years old in a hermitage that later became a Benedictine monastery. In time she became the leader of this monastery. When she was 52 years old, she founded a monastery of her own, and then a second one 15 years later. Each week she traveled back and forth between these monasteries in a small boat on the Rhine. Because she was known as a healer and miracle worker, people gathered on the riverbanks to ask for her help. She used river water to bless them -- as she is shown in this icon, ready to sprinkle them with water with a wild rose she has picked. From childhood and throughout her life she had mystical visions, which she kept to herself until her teen years. As an adult she began writing them down. Her writings speak of the divine feminine and the dignity of women. She believed that every woman who gave birth helped clothe God with humanity. She composed music for her nuns to sing, and spoke of Christ as God’s song. She taught that music recreated the original harmony that once existed between God and humankind, and that the human soul was a musical instrument on which God played music. Apart from healing through her prayers, Hildegard was skilled in herbal healing and in other medical lore of her day. She took particular interest in the health problems of women. Her scientific books contain more than 2000 remedies and health suggestions. Women in her monasteries had opportunities to develop their intellectual, artistic, and spiritual gifts. The monasteries she built had large, beautiful rooms, with piped water. On feast days her nuns wore white veils and gemstones to celebrate the dignity of their espousal to God. Near the end of her life she became involved in a dispute with male church authorities over the burial at her monastery of an excommunicated man. She was vindicated shortly before her death. Completely exhausted, she died at the age of 81. Legend tells that the skies were filled with colorful lights at her death. She was canonized by popular acclaim. Abbess, artist, author, composer, mystic, pharmacist, poet, preacher, theologian--where to begin describing this remarkable woman? 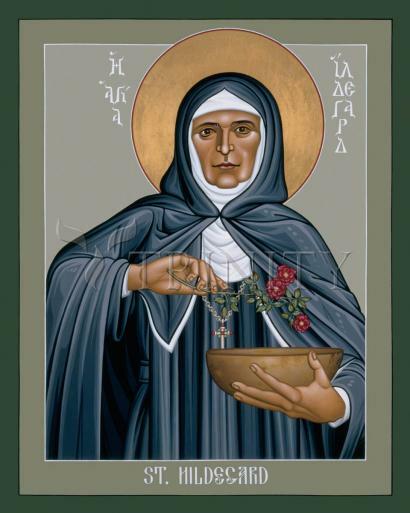 Born into a noble family, she was instructed for ten years by the holy woman Blessed Jutta. When Hildegard was 18, she became a Benedictine nun at the Monastery of St. Disibodenberg. Ordered by her confessor to write down the visions that she'd received since the age of three, Hildegard took ten years to write her Scivias (Know the Ways). Pope Eugene III read it and in 1147 encouraged her to continue writing. Her Book of the Merits of Life and Book of Divine Works followed. She wrote over 300 letters to people who sought her advice; she also composed short works on medicine and physiology, and sought advice from contemporaries such as St. Bernard of Clairvaux. Hildegard's visions caused her to see humans as "living sparks" of God's love, coming from God as daylight comes from the sun. Sin destroyed the original harmony of creation; Christ's redeeming death and resurrection opened up new possibilities. Virtuous living reduces the estrangement from God and others that sin causes. Like all mystics, she saw the harmony of God's creation and the place of women and men in that. This unity was not apparent to many of her contemporaries. In 2012, Hildegard was canonized and named a Doctor of the Church by Pope Benedict XVI.